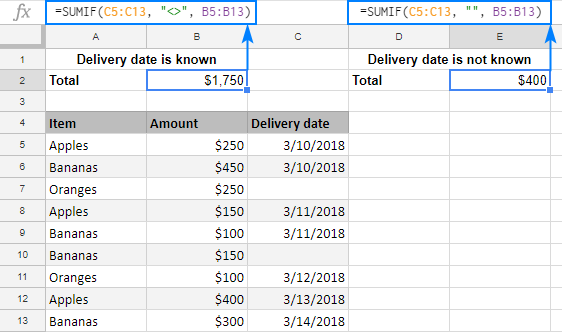 The tutorial shows how to use the SUMIF function in Google spreadsheets to conditionally sum cells. You will find formula examples for text, numbers and dates and learn how to sum with multiple criteria. Some of the best functions in Google Sheets are those that help you summarize and categorize data. Today, we are going to have a closer look at one of such functions - SUMIF - a powerful instrument to conditionally sum cells. Before studying the syntax and formula examples, let me begin with a couple of important remarks. 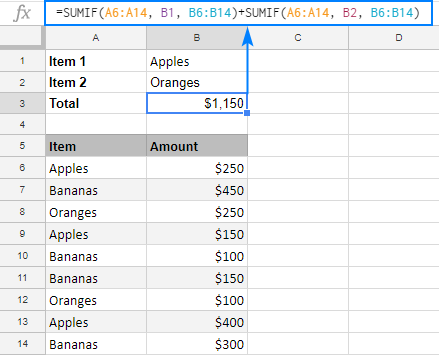 Google Sheets has two functions to add up numbers based on conditions: SUMIF and SUMIFS. The former evaluates just one condition while the latter can test multiple conditions at a time. In this tutorial, we will focus solely on the SUMIF function, the use of SUMIFS will be covered in the next article. 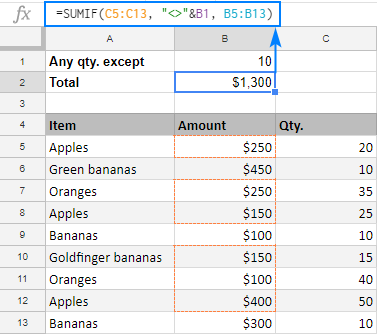 If you know how to use SUMIF in Excel desktop or Excel online, SUMIF in Google Sheets will be a piece of cake for you since both are essentially the same. But don't rush to close this page yet - you may find a few unobvious but very useful SUMIF formulas you didn't know! Range (required) - the range of cells that should be evaluated by criterion. Criterion (required) - the condition to be met. Sum_range (optional) - the range in which to sum numbers. If omitted, then range is summed. As an example, let's make a simple formula that will sum numbers in column B if column A contains an item equal to the "sample item". Range - a list of items - A5:A13. Sum_range - amounts to be summed - B5:B13. Criterion - a cell containing the item of interest - B1. 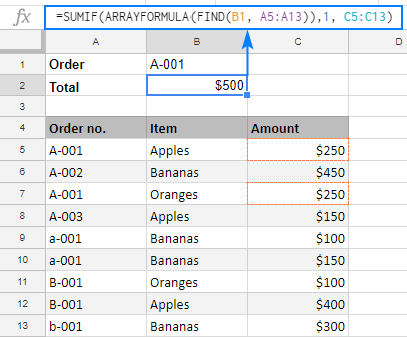 From the above example, you may have the impression that using SUMIF formulas in Google spreadsheets is so easy that you could do it with your eyes shut. In most cases, it is really so :) But still there are some tricks and non-trivial uses that could make your formulas more effective. The below examples demonstrate a few typical use cases. To make the examples easier to follow, I invite you to open our sample SUMIF Google Sheet. To add up numbers that have a specific text in another column in the same row, your simply supply the text of interest in the criterion argument of your SUMIF formula. As usual, any text in any argument of any formula should be enclosed in "double quotes". Please note that SUMIF in Google Sheets searches for the specified text exactly. 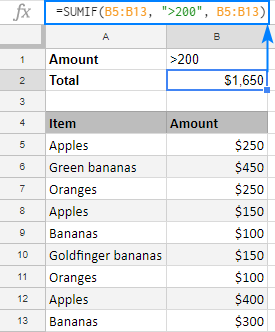 In this example, only Bananas amounts are summed, Green bananas and Goldfinger bananas are not included. To sum with partial match, use wildcard characters as shown in the next example. Question mark (?) to match any single character. To match an actual question mark or asterisk, prefix it with the tilde (~) character like "~?" or "~*". You use the case-sensitive FIND function to look for the exact order id. The problem is that a regular FIND formula can only search within a single cell. To search within a range, an array formula is needed, so you nest FIND inside ARRAYFORMULA. When the above combination finds an exact match, it returns 1 (the position of the first found character), otherwise a #VALUE error. So, the only thing left for you to do is to sum the amounts corresponding to 1's. For this, you put 1 in the criterion argument, and C5:C13 in the sum_range argument. Done! To sum numbers that meet a certain condition, use one of the comparison operators in your SUMIF formula. In most cases, choosing an appropriate operator is not a problem. Embedding it in the criterion properly could be a challenge. Please notice the correct syntax of the criterion: a number prefixed with a comparison operator, and the whole construction enclosed in quotation marks. To sum numbers that equal a specific number, you can use the equality sign (=) together with the number or omit the equality sign and include only the number in the criterion argument. =SUMIF(C5:C13, B1, B5:B13) where B1 is the cell with the required quantity. To sum numbers other than the specified number, use the not equal to operator (<>). To conditionally sum values based on date criteria, you also use the comparison operators like shown in the above examples. 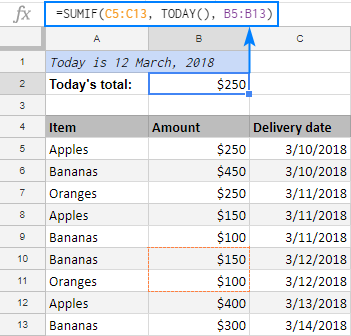 The key point is that a date should be supplied in the format that Google Sheets can understand. In case you want to conditionally sum cells based on today's date, include the TODAY() function in the criterion argument. In many situations, you may need to sum values in a certain column if a corresponding cell in another column is or is not empty. "=" to sum cells that are completely blank.
"" to sum blank cells including those that contain zero length strings. "<>" to add up cells that contain any value, including zero length strings. 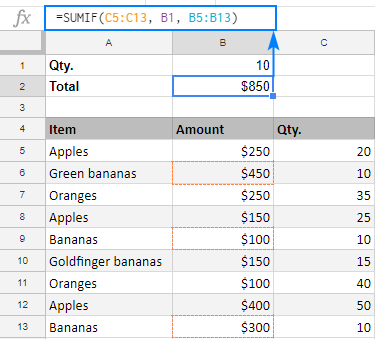 The SUMIF function in Google Sheets is designed to add up values based on just one criterion. To sum with multiple criteria, you can add two or more SUMIF functions together. Please note that this formula works like SUMIF with OR logical - it sums values if at least one of the specified criteria is met. 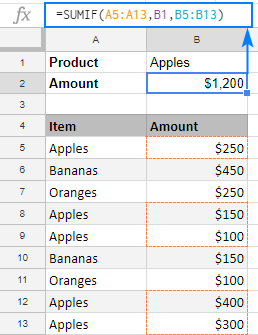 In this example, we add values in column B if column A equals "apples" or "oranges". In other words, SUMIF() + SUMIF() works like the following pseudo-formula (not a real one, it only demonstrates the logic! ): sumif(A:A, "apples" or "oranges", B:B). If you are looking to conditionally sum with AND logical, i.e. 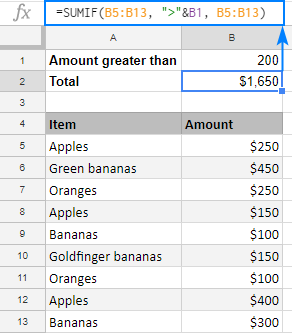 add up values when all of the specified criteria are met, use the Google Sheets SUMIFS function. 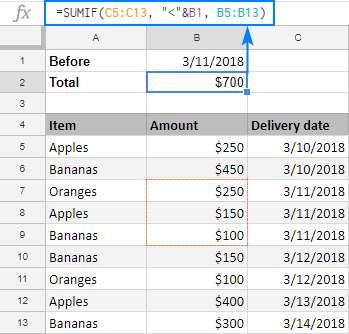 Now that you know the nuts and bolts of the SUMIF function in Google Sheets, it may be a good idea to make a short summary of what you've already learned. The syntax of the SUMIF function allows for only one range, one criterion and one sum_range. To sum with multiple criteria, either add several SUMIF functions together (OR logic) or use SUMIFS formulas (AND logic). If you are looking for a case-sensitive SUMIF formula that can differentiate between uppercase and lowercase characters, use SUMIF in combination with ARRAYFORMULA and FIND as shown in this example. In fact, the sum_range argument specifies only the upper leftmost cell of the range to sum, the remaining area is defined by the dimensions of the range argument. To put it differently, SUMIF(A1:A10, "apples", B1:B10) and SUMIF(A1:A10, "apples", B1:B100) will both sum values in the range B1:B10 because it is the same size as range (A1:A10). So, even if you mistakenly supply a wrong sum range, Google Sheets will still calculate your formula right, provided the top left cell of sum_range is correct. That said, it is still recommended to provide equally sized range and sum_range to avoid mistakes and prevent inconsistency issues. 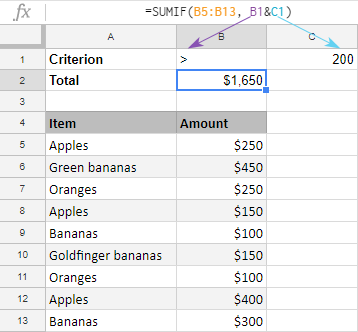 If you plan to copy or move your SUMIF formula at a later point, fix the ranges by using absolute cell references (with the $ sign) like in SUMIF($A$2:$A$10, "apples", $B$2:$B$10). 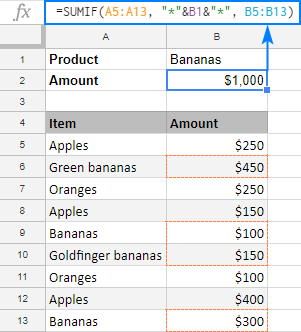 This is how you use the SUMIF function in Google Sheets. To have a closer look at the formulas discussed in this tutorial, you are welcome to open our sample SUMIF Google Sheet. I thank you for reading and hope to see you on our blog next week! 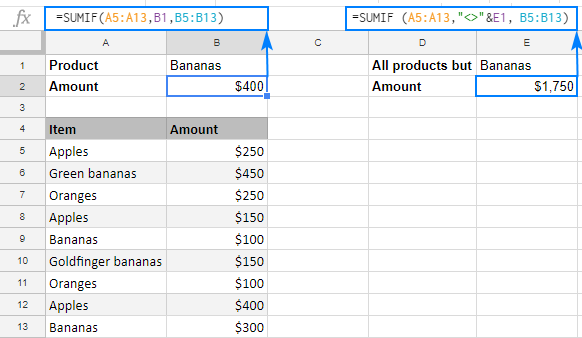 12 Responses to "SUMIF in Google Sheets with formula examples"
Very thorough tutorial. Love it! I've been trying to get a simple SUMIF to work and have it reference columns on another tab but Sheets does not seem to like this. Have you been able to get it to work? Tab to be referenced in the same sheet is called "Joint Chequing". thanks a lot for these great tips! How to do reference from a different sheet itself? Thank you for your question, Aneesh. Indeed, helpful. Thank you. But i would like you to help me to use sumifs between two or more sheets. Thanks. This is useful...However, I am looking to create a sheet that has buyer numbers and the costs of what they bought in it. So I will sort by buyer number and then want to sum what they owe. 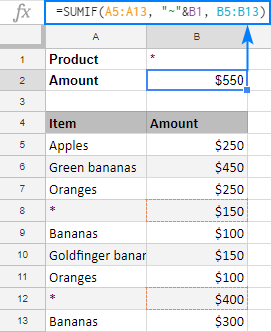 How do I use the SUMIF when I don't know what the criteria is (if buyer #2 bought 3 items, I want to sum those three columns; then if buyer # 3 bought 6 items, I want it to sum those 6 columns) I don't know how many items they will have bought. I hope that makes sense.... thanks! I would like to know if there are some optimisations about SUMIF. I mean, is the order of criteria important for the SUMIF? (stop the check when a criterion is false) For the very massive sheets, could be interesting. I'm trying to use this formula to put a value in a cell on a tab called 'overview' that calculates the sum of entries in column c of a tab called 'visit reports' that contain the word school in column b of the 'visit reports' tab. =SUMIF ('Visit reports'!B1:B300, "*school*",C1:C300). It is returning zero even when I have values in both column b and c. The sheet is at https://docs.google.com/spreadsheets/d/1PQFS5_fkhGGfR_2TcAudT9KKE98s8oq0L8zlcES3mNo/edit?usp=sharing. Can anyone help? Wondering if you need to put the sheet name with the sum range too. Looks like you managed to figure it out though. Can you add a note that when testing for equality, you don't need to specify a comparison operator?